Last week I had lunch with a brother in Christ and elder in my local church. He's the kind of guy who literally puts his phone number out there for anyone to call him. And many guys do, about one per week on average. Many of these guys say they want to get connected in the church in some way. In the past, this brother would send an email listing out the various groups guys could join, figuring that based on time and location, they'd select the best fit. The response rate on this old way of outreach was 1 guy out of 10 would respond to the email. After a recent conversation where we talked about how striking it was for me in California when a guy reached out to buy me coffee and just get to know me, this brother decided to try a new tactic. Now he emails guys with a simple request to get coffee and get to know them so he can help guys figure out where to connect. The response rate on this new approach is 9 out of 10 guys respond to the email. That's a 900% increase in response rate in under 60 days!!! People like to connect with people, not programs and groups. We need people willing to put their name and number out there. This takes time and commitment, this elder has had 10, maybe 20 coffee appointments over a couple months, which he just counts as the cost of making disciples. A "Christian brother" and I fasted for one day and agreed to pray for each others "business," and this is what happened. This impacted me greatly, as I processed what I heard God say to me so clearly. It opened my eyes to the glut of "training resources" and the shortage of Christians stepping onto the field, so to speak. What I heard made so much sense that I began to share it to anyone who would listen. I realized that the times where God was speaking most clearly to me was when I was living it out on the field, I was doing something about what He was telling me to do. I saw a way to help guide people into taking action with their faith, in fact, my job at the time for Cityteam was to do just that! I bought a web doman www.handsonchristian.com, set up social media handles, and even started working on a video to capture the message. I wanted it to be perfect so I worked my way into the Major League Soccer (MLS) Earthquakes stadium in San Jose, CA! Soon two others were attracted to this vision, it resonated deeply with what God was telling them to do, and the three of us together set to work to build out a minimum viable product (MVP) of this concept over the course of 90 days. It was an impossible task by any measure, even for a 17 year Apply veteran, and skilled community pastor, and I, but we embraced the reality that if it was God's plan, it would work. Ultimately, we couldn't find a way to solve the problem in a way that would generate revenue and we all got job offers that took us away from the project. But what I heard from God on that day stays with me, and I continue to examine whether I am just training more, or if I'm actually on the field with regards to my faith. The pull toward the former is so strong. In fact, the whole purpose of this blog is to encourage others to step out of their own comfort zone to take practical steps in their faith and their attempts to know God and Jesus. And, I still have it in my sights to build something to this end--something that provides a trigger point to unleash people into the active practical aspects of their faith. My hope and prayer is that in late 2016 / early 2017, this vision might become realized. To think that this all came from that vision God gave me in prayer during the World Cup in 2014, it's truly amazing how when we seek God in prayer, He can speak to us and inspire us, that in a single moment of quiet time listening, He can direct in such a rich way so as to literally change the way we think and even the trajectory of our life. I met up with some New Canaan Society dudes tonight. We talked about making God our focus even in the success in our careers. For a Christian man in business, it's not always clear if we're chasing our own glory or the glory of God. After a rich conversation, I walked a few blocks to my car. A man sitting at a table outside a pizza shop said "excuse me" as I walked past him. I was inclined to ignore him and keep going but something inside me said I should stop this time. He told me that his wife has cancer and was receiving treatment at Hahnemann hospital right next door. He said they were on hard times that they both have bachelors degrees and even health insurance but were homeless and he would love something to eat. Long story short I bought him dinner but more importantly I asked him if I could pray for him. At that moment I realized I had stopped more for me than for this man. His shirt gave me the answer to a night of discussion about how to know if we are after the right career in life. If I look back on my career and if I, or anyone else that knows me well, can say there's no way I could have done it on my own, that it's just too wild that God must have done it, i believe that's one way I will know I have fulfilled Gods will for my work here on Earth. Scripture clearly promises an extraordinary life full of the Holy Spirit doing even greater things than Jesus Christ. So, if my life looks ordinary or similar to that of someone who does not believe in Jesus Christ, then something is off. I'm not implying this means guaranteed success, in fact, in failure there is as much or more opportunity to see God working in my work. The last thing I want is someone to look at my work and see that I've strived to do the "right" things, the safe things, that I've done it myself, or find any sense I'm a self-made man. Whitney and I settled in to watch a movie after a Christmas dinner with our pastor and his family. As Whitney turned on the tv and looked for a festive flick, I took our pacing puppy Archie out for a pee. He tugged toward the front yard and then let out a low growl. "It's okay, Archie," I assured him--a cat was lurking I assumed. Though, right after I said these pacifying words to the pup, I felt a tug in my gut that something was up. Literally up. 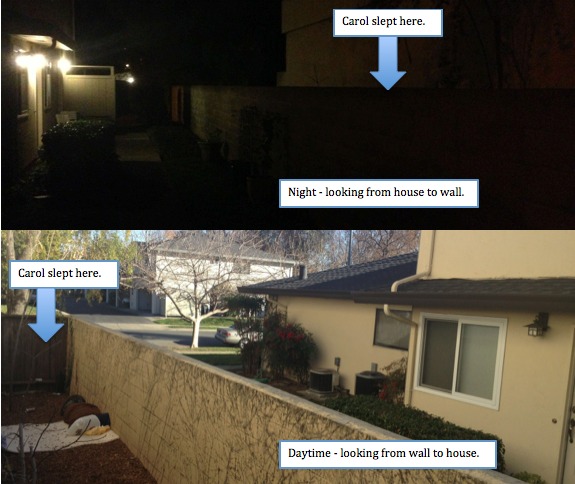 I looked at the high wall that separated my yard from a business park next door--then I had a sense to look over it. I stepped onto an oversize flowerpot and peered into the darkness. Not much visible, just a dumpster to the left and what appeared to be a pile of trash to the right. I continued to the front yard; but still, the pull in my gut persisted, as if to say look again, and so I did and once again found nothing. Archie did his business, but I had a nagging sense that mine was not finished. I walked around the wall into the business complex to look from another angle. Again, nothing out of the usual. Back around the wall I went to my house to watch a movie with my waiting wife, who was most likely wondering where I was. But this hunch in my gut wouldn't quit. So, for a fourth time I looked over the wall, and this time I called into the darkness, "is somebody there?" "I'm here," a head popped out of the pile of trash. "I'm here too," another head lifted next to the first. A woman had responded first and she immediately began to explain that she and her friend were not doing anything, that they were in separate sleeping bags even, it was just so cold that they needed to be close. To ease her fear that I would call the cops, I said, "I work for Cityteam and we work with the homeless." Her reply to me was, "God sent you to me!" Her response struck me. As a Christian, on Christmas, a woman just outside my door sleeping in a pile of trash, saying I was sent by God?? What's going on, I wondered? "Merry Christmas," I said. "You must be cold, can I get you something warm to drink and are you hungry?" I asked. "Yes, yes I am hungry," she said." Okay, let me get you something to eat, I'll be back soon." Back inside the house, I saw my bride ready to snuggle but it would have to wait. I filled her in and she snapped into action preparing dinner and a bag of provisions. Back outside, I walked around the wall and knelt down to the two sleeping bags. I learned their names were Carol and Bill. I prodded to learn more about how they ended up in this place on Christmas Day. Carol told me that she has been homeless for over 15 years, a severe alcoholic unable to stop drinking. Living in fear for her life every day from either lack of alcohol, medical issues, or violence on the streets. She was in this place, she said, because her camp next to a creek was burned up with all of her possessions a few days prior. As Carol talked more about her life and her children, I had a strong sense that this was a heavy spiritual battle and to tell her that she needs Jesus, and so I said just that. After a pause, Carol said I was right. She even knew something about Jesus, but I could tell her mind was not clear enough to have a spiritual conversation. I asked if I could pray, and they both said yes, and so we held hands and I prayed. I prayed that God would move in that place that very night, and move in Carol to take away her addiction, and move in her in such a way that she could not deny it. All while I was praying, I envisioned Jesus coming into the world in conditions similar to the encampment where I now kneeled. There was power in that prayer--I felt it. When I was done, Carol told me tearfully that she wanted to change, she was sick of her life, she was sick of being unable to help her children who had also fallen into addiction and trouble. I told her I wanted to help. I returned to the house to gather up the food, sandwiches, chips, fruit, vegetables, homemade hummus, candy, two Target gift cards, and more that Whitney had assembled. When I brought it all back, Carol was thankful, we talked a bit more, and then I left her with my business card and a challenge to call me the next day if she was serious about wanting to make a change in her life. This was not my first time making this offer to someone on the street, and I knew the chance of a call from her was slim. The next day, Carol called...and she kept calling. When we spoke, she confirmed she was ready for change--but what should she do? Seeing that at the time I worked for a company that operates addiction treatment centers, you'd think I would have a fast answer. But I needed to inquire with colleagues about how best to proceed, so I started making calls. I learned that in San Jose the best way for Carol was a medically supervised detox and then a long-term recovery program, which I hoped would be faith-based given my sense this was a spiritual battle. I passed on to Carol the number to call and encouraged her and prayed with her again. Every couple of days, Carol called me with an update. She started to tell me that something was strangely different in her life. In one call, her exact words were, "ever since you peeked your head over that fence with your wife's hummus and prayed with me, something is going on, you changed my life!" I told her it was not me, but the Holy Spirit of God inside me that made me look over that wall four times, and that God himself moved in her when we prayed. Listen to one of the many messages Carol left for me. The entrance into the San Jose program requires patience and persistence, especially for an addict. Carol had days where she was ready to give up, she would yell on the phone, and I would encourage her and remind her I was on her team and then she would calm down. It was also during this time she introduced me to Bruce, a friend who was helping her--he let her use his phone, would drive her places, buy her food and other supplies. Bruce had been through recovery himself several years prior and was now eager to see Carol do the same. One day I got a call from Carol with a report that she was officially on a waiting list to enter a clinic for detox. Great news! She had anywhere from a week to ten days until she would be admitted. I knew there was going to be a fierce battle for Carol's soul, satan wants nothing more than to keep her trapped in the gutter, the darkness, wet and filthy, on the brink of death. I began to pray for Carol even more than I had previously, Whitney and I prayed for her at each meal. A few days later, to encourage Carol, I asked her what she needed to make it until she was accepted into detox. She said she needed gloves and socks and a few other things, including a Bible--I was surprised by the request. Whitney and I went shopping for the supplies. 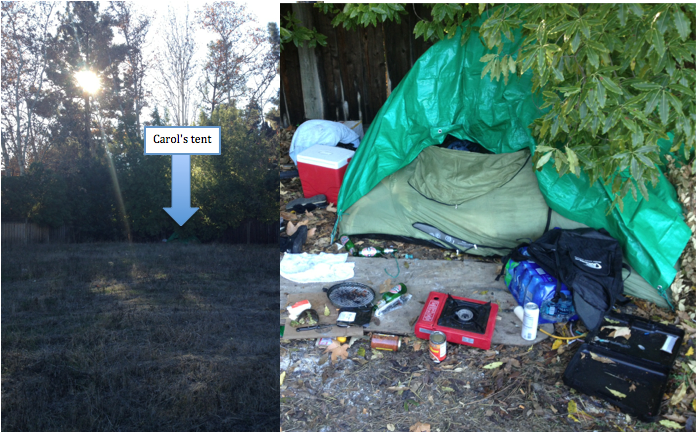 When we found Carol's tent tucked in the back of a vacant lot next to a Safeway grocery store, she was clearly drunk. She rifled through the bag of goodies, not seeming all that grateful. Then she pulled out the Bible, and perked up and she exclaimed, "You brought me a Bible!, you brought me a Bible!" She held it close to her chest, and I thought to myself that I had never seen someone react to receiving a Bible like this, and that God was surely up to something in drawing this woman. Then, one early Tuesday morning, as I gathered with a group of guys to pray as I often do, I had a hunch to have them pray for Carol. These men love to pray and when we do together we have seen miracles happen! And so when another guy in the group mentioned an encounter with a homeless person, it reminded me to mention Carol, who was impatiently awaiting admission to a clinic. We prayed that God would open doors for Carol that very day. Later that day, as I laid down for a nap the phone rang. I recognized the number and picked up just before I fell asleep and would have missed the call. It was Carol and she was overjoyed to tell me that she has just received a call that the next day at 11 a.m. she was to be accepted into a six month detoxification and addiction recovery program. I told her that that very morning I prayed for her with a bunch of guys that God would open doors for her, she couldn't believe it. Ecstatic is an understatement. She said things like: "no way!," and "this thing God is doing in my life is....I can't knock it out....its undeniable," and "God is amazing, He is changing my whole life." To top it off, she told me that it was her birthday. I asked her about her favorite cake (it's cinnamon coffee cake), and Whitney and I bought one and dropped it at her tent to celebrate her new life. Make no mistake, all of this was a miracle. That a woman who has been homeless for over 15 years living in the largest and most violent encampment in the country would be found by me on Christmas Day due to a nagging sensation in my gut, and after a powerful prayer over her that night she would call me to report an unmistakable draw on her life to beat addiction and homelessness, that she would then jump for joy upon receiving a Bible, and now, on her birthday, the same day 15 guys prayed for an open door for her, that she would get a call to enter a program.... these are the ways of life that cause people to throw their arms up and say PRAISE GOD! Any one of these events is unlikely, together they are so far beyond coincidence as to become certainly the hand of God working in a supernatural way. I kept praying: Lord, keep Carol in the palm of your hand, be her strength amidst her weakness as she heals from years of destruction, and Lord, destroy the enemy, that dirty devil, from having any way in her life right now. Amen. Again, I just knew that Carol was going to face a battle in this next big step. But I knew that I could not force Carol, she had to choose to show up for detox. I resolved to simply pray for her when the time came to go to detox at 10 a.m. the next day. And at 9:50 a.m. my phone rang, it was Carol, and she said she was not going. My heart sank, and I inquired how this could be. Carol told me that she needed a certain kind of drug to aide her detox, and if she didn't have it she would die. Someone had told her this on the street, and it became the absolute truth to Carol, despite the detox facility telling her otherwise. Carol said she could not go without this medication. Her plan, she told me, was to go to the Emergency Room to get a prescription, and then she would return to detox as planned. I told her to hold on the phone while I asked a colleague with decades of experience on the streets if this was realistic. What I learned is that this is never done, I urged Carol to go to detox, and she promptly hung up the phone. Not even two hours later, Carol called me back, she had her prescription and was back to detox. She thanked me, she said she was scared, but she was going to do it, she was ready. I told Carol that I was proud of her, and that she had to know it was going to be difficult, that she might even face spiritual attack, but that she should just open her Bible and read it, or pray to God like he is her friend sitting next to her. Then I hung up the phone and I praised God for opening doors for Carol that nobody thought possible. For the next week I got an occasional report from Bruce about Carol's condition. He visited as much as they would allow, and said she was doing well. Seven, eight, nine days went by--Bruce was delighted, I could hear it in his voice. She was making it. He revealed to me that he too believed God was behind all of this too. I asked him why and he explained how that as he went through the Alcoholics Anonymous program, he used to read his AA "Big Book" next to a lake, and where the book says to believe in a "higher power" he often saw geese flying over, so he made the geese his higher power. It worked for him, he said, and when he dropped Carol off, just as she walked into the detox center, a flock of geese flew over and he broke into tears. On the tenth day, Carol left. Why? Bruce said that Carol was waiting in a van for a ride to the hospital for a check-up and a woman in the seat behind her freaked out and started kicking her seat, and she couldn't handle it, so in that moment of weakness she left. When I spoke to Carol, she was angry, trying to explain and place blame. I encouraged her to try again, to pray, to tap into that pull in her that changed her heart. She didn't want to hear it now, she shouted into the phone, we parted ways. I knew I could not force Carol to do anything, I resolved to pray for her more but it sank in that ultimately Carol had to choose God back. He moved in her and opened doors so clearly, but she had to accept him and turn to him when things got rough. My time watching Carol's life change so clearly through things that cannot be explained by worldly measures, that happened against all odds, despite the outcome it gave me a renewed sense that God hears our prayers. And seeing the outcome reminded me too that we have free will and ultimately a relationship with God, like with any other person, to flourish it has to be reciprocal.